Socially reared zebra finch males imitate a song they hear during posthatching days 30–65; during this time, many new neurons are added to the high vocal center (HVC), a forebrain nucleus necessary for the production of learned song. New neuron addition drops sharply after day 65, and no new songs are imitated. In contrast, male zebra finches reared in isolation from other males have more variable songs at day 65 and thereafter can still imitate new sounds (Eales, 1985). 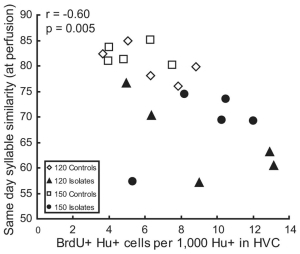 We show that, in isolate birds, a greater number of new neurons continues to be added to HVC during the next 85 d, and this number correlates with syllable variability. We suggest that new neuron addition and turnover facilitate song change and that this effect lingers when an expected learning event is delayed.